It was with incredible speed that a mellow moonlight horseback ride turned into a mind boggling, adrenaline-filled event. In my mind's eye I could see what was going to happen, and I knew that it was humanly impossible to react fast enough to prevent the inevitable . . . I was bringing up the rear on one of my four-year-old fillies, Awaj, as we rode toward our chosen destination, a lovely spring under a large cottonwood in the canyon south of the ranch. 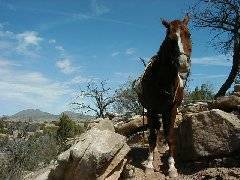 My filly had always been a very reliable and brave trail horse. She was born on the ranch and had roamed with the herd since her birth, showing few signs of fear. When a person trains young horses, the trick is to stay on, no matter what crazy move a youngster might try. The llightning-fast 180-degree turns can be the most challenging, perhaps even more than those classic crazy rearing and bucking moves! In the mid 1980s I discovered the Australian Stock Saddle. With their deep seats and high thigh pads, known as Poleys, it is next to impossible to become unseated. There is virtually no antic from a horse of any age that can toss me now! Awaj had been over Cliff Trail many times, never a fuss. But tonight, as we began the descent, she suddenly turned around to head for home. The trail is barely the width of the horses’ feet, with large boulders going down to the bottom of the hill; to add to the treachery, a barbed wire fence runs along the north. As Awaj tried to turn around, she stumbled, and her 900 pounds began to fall to the right, heading upside down toward the boulders and the barbed wire. Centrifugal force and gravity were taking me over the edge with her, as I was securely seated in my Australian saddle. The next thing I knew, my angel friend had grabbed my left hand, and I found myself standing at the top of the cliff. I watched as Awaj hit a large boulder, scraped along the fence, landed at the bottom of the hill, then jumped to her feet. It happened so fast that all I could do was say, ‘’Praise You, Lord Jesus!! Thank You, Father! Hallelujah! ’’ It is true—&He dwells in the praises of His people& (Psalm 22:3, 50:23). In one instant, I was falling over the cliff, securely seated on my horse; then in the blink of an eye found myself at the top, watching Awaj tumble and fall in agonizing slow motion and suspended time. The angel also made her legs go the opposite direction from the fence, avoiding a bad entanglement. As she trotted over to her mother, being ridden my by friend, I could see his mouth opening in awe, amazed at what he had just witnessed! Awaj had long rows of bloody wire cuts across the top of her loin, but after a few minutes the bleeding stopped. 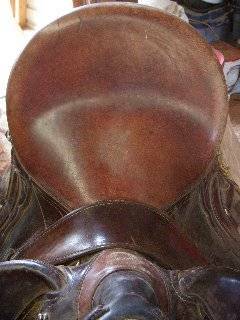 My saddle had boulder bruises on the cantle, dirt buried in the horn, and deep wire gashes on the cantle and seat. Praise God that is was tough, high quality leather, and not fragile human skin and bones that took the abuse! And Hallelujah, my filly was fine too! Each time I step into my saddle, I have a little reminder of the way the Lord works in our everyday life. Awaj, too, will have a permanent ‘’brand’’ of His Amazing Grace.. Some say that their guardian angels are visible, but I never actually saw mine. I only felt the powerful hand around my arm and the amazing speed at which I was removed from a potentially deadly situation. So many times since then I have known that angels were there intervening in many situations, large and small. May each of us be aware that God is with us always!